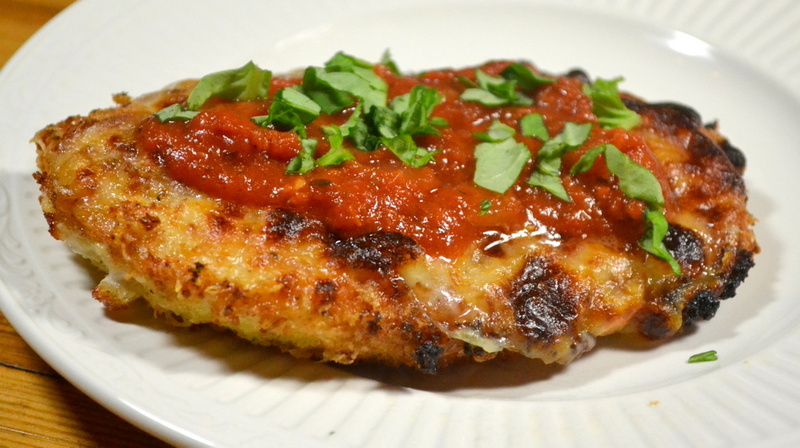 Normally I don’t like Chicken Parmesan because the marinara sauce feels too heavy and overcooked. So I was excited to try this recipe after seeing the photo on Chris Kimball’s website; the tomatoes looked fresh and bright. However, the reality is that he uses the same can of crushed tomatoes that I’ve always used to make my red sauce. On the plus side, the generous amount of fresh Parmesan in the breading adds great flavor. So it’s better than average, but the not the “best”. The continued use of canned tomatoes leaves in place the exact thing that I dislike about Chicken Parmesan. My red-sauce loving son gave this 5-stars, but I can only give it 3-1/2. Just as every sauce recipe that I’ve ever made, this recipe uses a whole, 28-oz can of crushed tomatoes. I only used about 1/4 of the sauce; but the sauce was so inexpensive to make (about $1.25) that there is no reason to make less. My son, who hasn’t eaten jarred red sauce in 3 years, was happy with the leftovers. I didn’t use the recommended Fontina, because I don’t generally use it and didn’t want to buy it for just 2 ounces. Instead I used 4 ounces of mozzarella. Started: 4:30 pm. Dinner Time: 6:00. Lay chicken breasts flat on cutting board and freeze them for 15 minutes so that they become firm. Trim away any excess fat and cut breasts in half horizontally to form two thin cutlets. Use a meat pounder to flatten only the fat ends; leaving a uniform 1/2″-thickness. Evenly sprinkle both sides of chicken with a total of 1 teaspoon Kosher salt. Allow to sit at room temperature for 20 minutes. Meanwhile, prepare the sauce. Peel and mince the garlic cloves. Place a medium-size sauce pan over medium burner and pre-heat 1 tablespoon live oil until it begins to shimmer. Add pressed garlic cloves, 3/4 teaspoon kosher salt, 1/4 teaspoon dried oregano, and the pinch of red pepper flakes. Saute for 30 seconds, then add crushed tomatoes and 1/4 teaspoon sugar. Increase burner to high until it reaches a simmer, then reduce to medium-low and simmer for 20 minutes until the sauce has thickened. Remove from heat, add chopped basil and 1 more teaspoon of olive oil. Adjust season with salt and pepper according to your taste. Cover the pot to keep it warm while you finish cooking the chicken. While the sauce is cooking prepare your remaining ingredients. Shred your mozzarella and fontina, combine in a small bowl, and set aside until step 7. In a pie plate, whisk 1 egg and 1 tablespoon flour together until it becomes smooth. Grate your Parmesan cheese directly into a second pie plate, then combine with panko, garlic powder, oregano, and ground black pepper. Set an oven rack about 4″ from the broiler element and begin pre-heating. Use paper towels to pat the chicken dry. Coating on piece of chicken at a time, dredge through egg mixture and allow any excess egg to drip back into the pie plate. Put in bread crumb mixture and gently press so that the coating adheres to the chicken. Put coating chicken on a large plate, and continue coating the remaining chicken. Place in a 10″-nonstick skillet over medium-high burner. Pre-heat 1/3 cup vegetable oil until it begins to shimmer. Add two pieces of chicken at a time into oil, and cook for 2 minutes per side without moving. Carefully flip the chicken using tongs and cook the second side for 2 more minutes. Remove cooked chicken to a plate lined with paper towels. Cook the second batch of chicken. Put the cooked chicken on a foil-lines baking sheet and spread cheese evenly trying to cover as much of the chicken as possible. Broil for 3 to 4 minutes until the cheese has melted and is beginning to brown. Put chicken on serving platter and top with 2 tablespoons of sauce per chicken. Sprinkle with minced basil and serve immediately. Pass additional sauce separately. My first Tatar-Tot-experience was from my mediocre Jr. High School’s cafeteria. Even still, they were delicious and I never figured out why my mother never made Tator Tots when I was growing up. I have always loved them, and I’ve made them for my kids many, many times; but only from a bag. So I was excited to see in the latest season of Cook’s Country that Tator Tots can be made from scratch. I made them for a recent sleepover with 5 teenage boys. They were easy to make, but there were a few minor problems. First, 10 minutes in my microwave didn’t seem to fully cook the potatoes, compromising both texture and flavor. They were just undercooked, not raw, so an extra 2 to 4 minutes would be enough extra time. Second, I failed to properly estimate the amount of time they would take to prepare. Budget a full 1-1/2 hours. 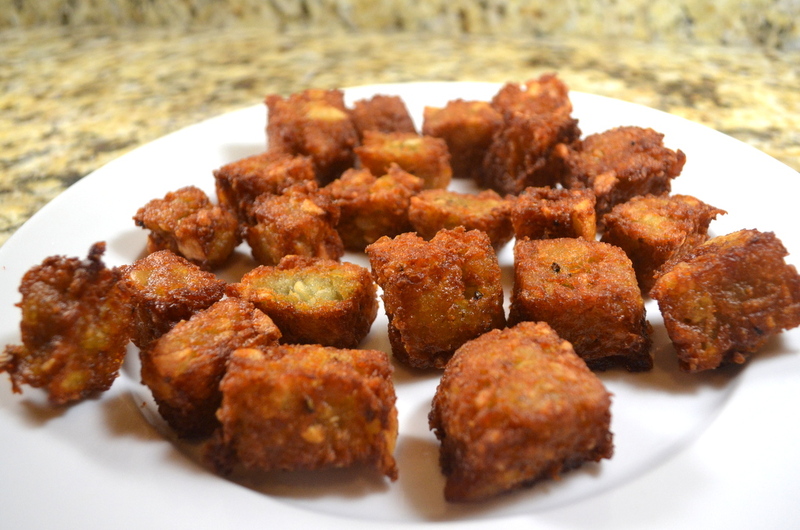 Third, the boys wanted the Tots to be round; not square. Fortunately, the bar to make a sleepover a success is set pretty low; having more to do with the smile on my face than perfectly cooked Tator Tots. As they were, I can only give them 3-1/2 stars. Not worth the effort when compared to the bag. But I will try them again and update the review if I am more successful next time. Chris Kimball warns that if you have a food processor with capacity less than 11 cups, that you need to process the potatoes in two batches. I did this, using half the water in each batch. When I pressed the water out of the potatoes I didn’t check to see if I yielded 1-1/2 cups of liquid. If I didn’t, that may explain why the potatoes didn’t fully cook during the 10 minutes in the microwave. Chris Kimball says that you can cool the fried leftovers, then put in a zip-lock bag. They can be frozen for up to 1 month. Bake at 400-degrees for 12 to 15 minutes to re-heat. Whisk 1 cup water and salt together in bowl until salt dissolves. Peel your potatoes and cut them into 1-1/2″ pieces. In one or two batches depending upon the size of your food processor, add the potatoes chunks and water. Pulse 10 to 12 times until the potatoes become coarsely ground. Empty into a fine mesh strainer and use a rubber spatula to press out 1-1/2 cups of liquid. Put potatoes into a large glass bowl and microwave (uncovered) for 10 to 14 minutes; stir potatoes once after 5 minutes. The potatoes should become dry and sticky. Add 1-1/2 tablespoons flour and 1/2 teaspoon pepper, mix until combined. Allow to cool for 10 minutes by spreading the potatoes out on a foil-lined sheet pan. Use a spatula to push the mixture to the center of the foil, and put in an 8″ square cake pan. Use a spatula to evenly spread the potatoes, then fold the foil over and firmly press the potatoes to ensure they are even, compact and fill the corners. Freeze for 30 minutes, so that they are easier to cut. While the potatoes freeze, begin pre-heating your oil over a high burner to 375-degrees (about 10 minutes). If you want to serve both batches at the same time, pre-heat your oven to 200-degrees. I served the first batch immediately, and therefore didn’t pre-heat my oven. Use the foil to lift the potatoes and put them on a cutting board. Cut them into bite-sized tots. Depending upon the exact size of your cake pan, that could be 6×8 or 5×9. When the oil reaches 375-degrees, use a wide, metal spatula to gently lower half your tots into the oil (without splashing). Fry each batch for 6 to 7 minutes until they become crispy and golden brown. Remove from oil as they become ready and drain on a wire rack set over a foil-lined sheet pan. Season with salt. Keep the fist batch warm in your 200-degree oven while you cook the second batch. Repeat steps 8 and 9 for the second batch. Young teenagers can be finicky eaters, so for a recent gathering of my kids’ friends I make Chris Kimball’s Taco Bake. It’s a hybrid between ground beef tacos and nachos, but I think taste better than either one individually. Of course, steak tacos beat out this recipe in terms of taste. If this recipe in the analogy section of the SAT, it would read “Guacamole is to Seven-Layer Dip, what Nachos are to Taco Bake”. But It was a big hit with the 13-and-14 year old boys, and I thought the recipe was delicious and easy to make. A nice weekday for the kids. 4-stars. If you can’t find Ro-Tel tomatoes, you can substitute a 14-1/2-oz can of regular diced tomatoes and a 4-oz can of chopped green chiles. Of that use 6 tablespoons of tomato juice and 2 tablespoons of chile juice. Alternatively, you can use 4 ounces of Colby and 4 ounces of Monterrey Jack cheese in lieu of 8 ounces of Colby Jack cheese. If you would like to make it ahead-of-time, prepare the ground beef filling through step 6 and allow to cool to room temperature. Cover the baking dish using plastic wrap to cover, which will allow you to and refrigerate for up to 2 days. Remove the plastic wrap and resume the menu on Step 7, but increasing the cooking time to 20 minutes. Drained Ro-Tel tomatoes and set aside 1/2 cup of juices. Peel garlic cloves. Mince onion. Mince cilantro leaves. Set an oven rack to the upper-middle of your oven, and pre-heat to 475 degrees. Line a 13″x9″ baking dish with aluminum foil. Add the refried beans, half the drained tomatoes, minced cilantro, and hot sauce into baking dish and mix until combined, then smooth into an event thickness. Evenly sprinkle half the cheese (1 cup) over the bean mixture. Preheat 1 tablespoon vegetable oil a 12″ skillet over medium burner until the oil begins to shimmer Add minced onion and 1/2 teaspoon table salt. Cook for 5 to 7 minutes until the onion softens, then press garlic directly into skillet, and add chili powder, cumin, coriander, and oregano. Saute for 1 minute. Add ground beef and cook for 6 to 8 minutes until it is no longer pink, using a wooden spoon to break up the meat. Add the remaining tomatoes, the 1/2 cup reserved tomato juice, cider vinegar, and brown sugar. Bring up to a simmer and continue cooking for 10 minutes until the mixture is nearly dry. Adjust salt and pepper according to your taste. 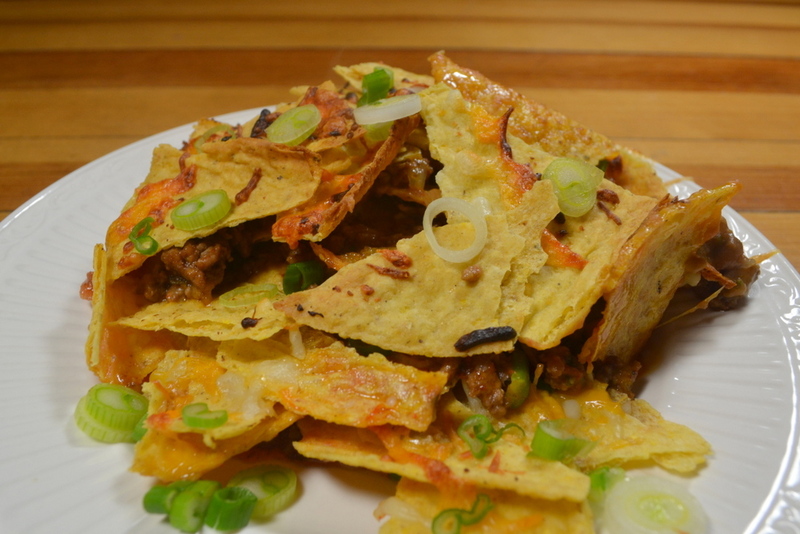 While the meat cooks, shred cheese and break the taco shells into 1″ pieces. Also slice scallions thinly. Evenly distribute the beef in the baking dish. Sprinkle with 1/2 cup more cheese over beef. Scatter the taco shell pieces over the top, then finally sprinkle with the final 1/2 cup shredded cheese. Bake for 10 to 15 minutes until the filling begins to bubble and the top becomes spotted brown. Allow to cool for 5 to 10 minutes, then sprinkle with the sliced scallions before serving. My oven stopped working a few weeks ago (I can only broil), so I’ve been limping along making stove-top dishes until I can get General Electric to come and fix the oven. I picked today’s dinner based solely on my ability to braise the chicken without my oven (the preferred braising method). In the end, the chicken was perfectly cooked. But the skin that I so carefully browned in step 3 turned out soggy by the end of cooking. I’m undecided if, next time, I will remove the skin prior to cooking. The recipe requires vastly different cooking times for white and dark meat, and because my white meat only needed 20-minutes, the sauce had not sufficiently reduced. I ended up with 2 cups of weak sauce. If you are only cooking white meat, then I’d recommend reducing the sauce after removing the chicken to concentrate the flavors. Overall, 3-1/2 stars. Had the sauce been more concentrated, I would have rated it higher. The recipe also called for a few specialty ingredients, which I did not use. Chris Kimball uses Dark Soy Sauce and Sichuan peppercorns; both of which require a trip to an Asian market. I used regular soy sauce and added 1 tablespoon of molasses. Chris Kimball says that you can just substitute regular Soy Sauce (he doesn’t mention the molasses) but warns that the flavors will be blander. Afterwards, I found this recipe or this recipe that may make for a better substitution. As I mentioned above, there was way too much sauce, and it’s flavors were not sufficiently concentrated. It may also be that I used regular soy sauce. I modified step 9 with my suggestion about reducing the sauce (my not be necessary if you use Dark Soy Sauce). This was my first meal that I’ve cooked using whole Star Anise. It was $4 in my spice aisle, but I found a $1 package in the Mexican aisle. Hard boil the four eggs by placing in a pan of cold water, slowing bringing it up to a boil. Boil for 5 minutes, the remove from burner and allow to sit, covered, for 10 minutes. Meanwhile, trim your chicken pieces on any excess fat. If you are using chicken breasts, slice them in half crosswise. Use paper towels to pat the chicken dry. Place a large Dutch oven over medium-high burner and pre-heat 2 tablespoons of oil until it just begins to smoke. Brown the chicken in two batches, about 6 to 8 minutes per side. I used a splatter-screen to reduce the mess. As the pot heats up, you may need to reduce the flame to prevent the pan from scorching. When the chicken is browned, put it on a clean plate while you brown the second batch of chicken. 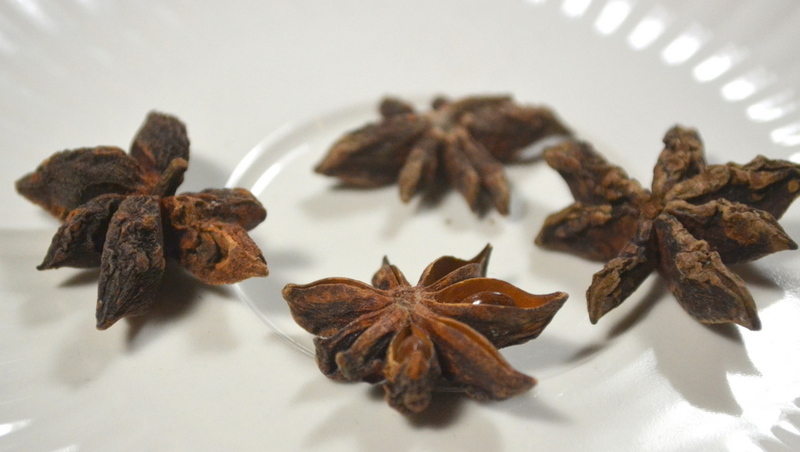 Meanwhile, peel and press your 6 garlic cloves into a small cup or bowl along with peppercorns and star anise. Mince or grate your fresh ginger, which should give you 2 tablespoons, and add in with the garlic. Peel your hard-boiled eggs so that they are ready for step 7. Pour off any excess oil, leaving about 1 tablespoon in your Dutch oven. Add the garlic/ginger/peppercorn/anise to the pot and saute for 30 seconds. Add 1/2-cup soy sauce, 1/3-cup chicken broth, 1/4-cup rice wine, toasted sesame oil, and brown sugar. Use the liquid to deglaze your pan. If you are cooking a mixture of dark and white meat, add the thighs and drumsticks 40 minute prior to adding the white meat (and eggs). Set chicken in braising liquid, bring up to a simmer, cover, and reduce burner to medium-low. The dark meat will need a total of 60 minutes, and the white meat will need just 20 minutes. Add the hard-boiled eggs with the white meat. Flip the chicken and eggs half-way through cooking. 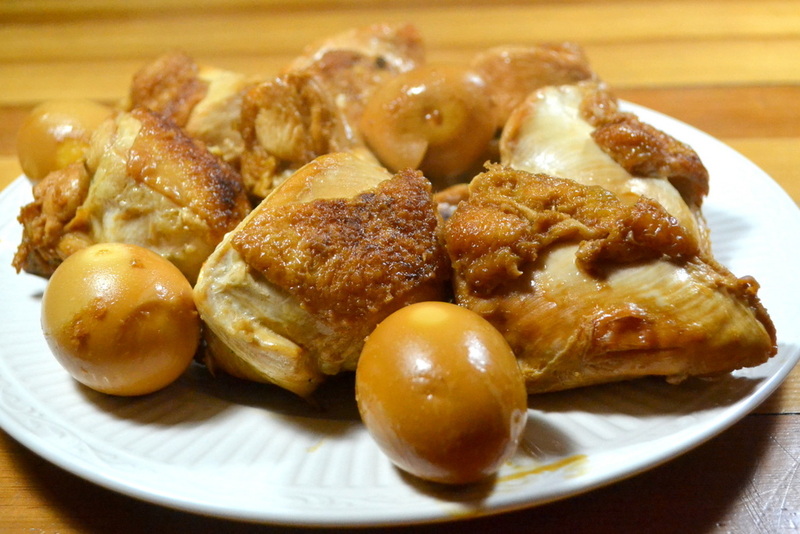 Once the chicken has reached the desired internal temperature (165-degrees for white and 175-degrees for dark meat), remove chicken and eggs to a serving platter and tent loosely with aluminum foil. If you are cooked dark meat, then the hour of cooking time will have sufficiently reduced the sauce. However, if you only white meat, allow the chicken to rest in a 200-degree oven to cook it warm and turn up burner to medium-high and reduce for 8 to 10 minutes to concentrate the flavors of the sauce. Skim as much fat as possible from the sauce, and pour it over the chicken and eggs, serving any remaining sauce separately. 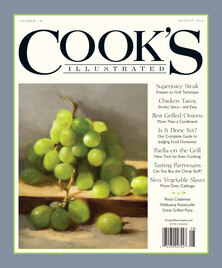 You are currently browsing the My Year Cooking with Chris Kimball blog archives for March, 2013.